This page is about best ever lemon-coconut squares. A popular dessert that brings together the flavors of lemon and coconut in rich delicious squares. 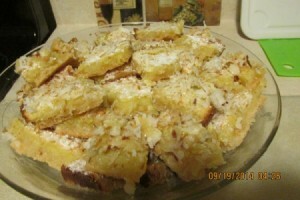 A sweet coconut twist on the ever popular lemon squares. Source: A little taken from a few recipes, the coconut and confectioners topping was my idea. Something different! Grease (I spray oil) and flour a 9x13 inch pan. In a medium bowl, stir together 2 cups of flour and 1 cup confectioners' sugar. Press into the bottom of the prepared pan. Bake in preheated oven for 15 minutes, or until golden. In a large bowl, beat eggs with mixer until light. Combine the white sugar, baking powder, salt, and 1/4 cup of flour so there will be no flour lumps. Stir the sugar mixture into the eggs. Finally, stir in the lemon juice. Pour over the prepared crust and return to the oven. Bake for an additional 30-40 minutes or until bars are set. Using a sifter, sift accross the squares with a light coating of confectioners' sugar and scatter a light coating of flake coconut. Then put in the broiler for 3-5 minutes, just to toast the coconut. Watch it carefully! Enjoy!